An elegant white rose bush in matching white ceramic pot. Perfect for any room, and so lifelike that visitors will bend to smell the perfume! Height 81cm – from our Luxury Silk Range.We are delighted to offer our range of silk flowers from the inspirational company Floralsilk who have the Kew Garden Seal of approval for their collection. Head of Licensing at RBG Kew Enterprises Ltd, Quincy Leon says We only partner with the very best companies in their field and she adds The Kew flowers and plants are exceptionally life-like. The Royal Botanic Gardens, Kew is a world leader in plant science and conservation. 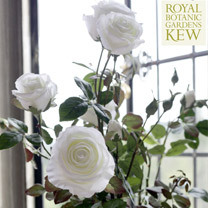 Every purchase from the Kew range will contribute towards Kews vital work. Beautifully hand-crafted Best flower replicas weve ever seen They will look stunning for many, many years Ideal for those with pollen allergiesKew Garden Seal of Approval.The images for this range were photographed at Bovey Castle located in Dartmoor National Park. A superb British-bred chilli with black-tinted leaves that will make a real talking point for your sunny patio or greenhouse. 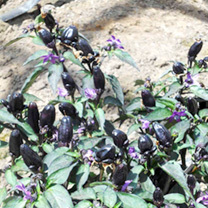 The plants produce striking purple flowers and very spicy black fruits about 2.5cm (1) long which ripen to a vibrant red. Scoville rating approximately 45,000. You don’t have to have a large vegetable garden to grow your own. Even the smallest patio or balcony can accommodate a few containers that will give you a bumper crop of delicious fresh produce! 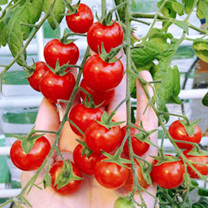 A vigorous-growing cherry tomato producing long, fishbone-shaped trusses of shiny red, deliciously sweet and tasty fruit. Ideal for heated and unheated glasshouse or polytunnel.What’s so good about grafted veg plants?We are revolutionising the home grown vegetable market with our range of grafted vegetable plants! Commercially the grafting method has been used for some time, but we’ve developed them for the home gardener, and early adopters have had extraordinary results: Big increases in yield from larger, more vigorous plants Earlier cropping, yet with sufficient vigour to crop well later in the season Grow in the greenhouse or outdoors – little or no heating required Excellent resistance to soil-borne pest and diseases – no more ring culture or grow bags – plant straight in the soil Greater tolerance to nutritional disordersTomatoes – We have selected leading commercial varieties and some traditional favourites – chosen for their fruit quality and taste – and grafted them, under carefully controlled conditions. Varieties are listed in approximate order of fruit size. Note that grafted tomatoes are not suitable for grow bags. An improved technique for tomato grafting – Since 2012, all our grafted tomato varieties now use this new technique which leads to even earlier and bigger crops, with fruiting beginning lower on the stems, producing at least one extra fruit truss per plant during the season!